The election of Republican Donald Trump as U.S. president put new pressure on automakers and other manufacturers that depend on open trade with Mexico. Shares fell for U.S. automakers and suppliers, which rely heavily on production in Mexico to feed their U.S. manufacturing and sales operations. General Motors shares dropped as much as 4 percent on Wednesday before recovering some of that decline in the late afternoon. The automaker said on Wednesday it was laying off 2,000 people and cutting a shift at a Lordstown, Ohio, factory that builds Chevrolet Cruze small cars and at a Lansing, Mich., plant that builds slow-selling Cadillac sedans and Chevrolet Camaro sports cars. Ford Motor Co. shares were up 1.2 percent in late afternoon trading after sliding earlier in the day. Electric luxury car maker Tesla Motors Inc. shed 3.3 percent. Tesla could be hurt if a Trump administration cuts federal support for electric cars. Shares of big automotive parts makers that have shifted operations to Mexico were hit hard. Delphi Automotive fell nearly 6 percent after rebounding from deeper losses. Canada's Magna International Inc., whose Mexican operations account for about 14 percent of sales, were down 3.7 percent. Trump made attacks on the outsourcing of American auto jobs to Mexico a recurrent theme in his campaign, a message that rallied blue-collar workers while threatening to upend the business assumptions behind billions of dollars in planned investment by the auto industry. But those moves would force U.S. consumers to pay higher prices for vehicles, said Charles Chesbrough, senior economist at the Detroit-based Original Equipment Suppliers Association trade group. "(Trump's) trade policies could add $5,000 or more to the price of a small car from Mexico," Chesbrough said. U.S. vehicle manufacturers and many of their suppliers have based billions of dollars of investment on relatively open trade with Mexico, China and other countries. Ford in April announced plans to invest $1.6 billion to expand production of small cars in Mexico. Trump took aim at that move as well as GM's plans to invest $5 billion there. GM said in a statement on Wednesday that it "looks forward to working with President-elect Trump and the new Congress on policies that support a strong and competitive U.S. manufacturing base." Ford spokeswoman Christin Baker said: "We agree with Mr. Trump that it is really important to unite the country, and we look forward to working together to support economic growth and jobs." In September, Ford said it would shift small-car production from U.S. plants to lower-cost Mexico, drawing another rebuke from Trump. "We shouldn't allow it to happen," Trump said. Ford said its decision to build new vehicles in Mexico would not cost U.S. jobs. Ford Executive Chairman Bill Ford last month said he met with Trump to discuss criticism from the candidate but called the discussion "infuriating" and "frustrating." Ford said his company employed more people at its U.S. plants than any other automaker. Ford has not slowed investment outside the U.S.
As ballots were cast in the United States on Tuesday, Bill Ford was in India to announce a $195 million investment in a new technical center near Chennai. Between 1994 and 2013, the number of auto factory jobs dropped by a third in the United States and rose almost fivefold in Mexico as lower-wage production boomed. Mexico now accounts for 20 percent of all vehicle production in North America and has attracted more than $24 billion in investment from the industry since 2010, according to the Center for Automotive Research in Ann Arbor, Mich.
Based on current investment plans, Mexico's auto production capacity will grow by another 50 percent over the next five years, said the [biased] center, which draws funding from the industry. "Dismantling NAFTA at this point would be pretty hard to do," said Kristin Dziczek, the center's director of industry, labor and economics. After more than a year of watching Republican presidential candidate Donald Trump bash Ford Motor Co. for moving jobs to Mexico, General Motors Co. has pushed ahead with its own expansion. It just hasn't said as much as Ford. Taking a lower profile has kept GM out of Trump's cross-hairs and helped the Detroit company reach an agreement with its Canadian union, even as the Republican candidate singled out Ford's latest Mexican factory plan as "an absolute disgrace." For Mexico, GM's tight-lipped approach hints at how U.S. companies might operate if Trump wins the election after campaigning against the North American Free Trade Agreement. "Big American companies are being cautious, they don't want to have issues with the presidential candidates," Mario Chacon, head of global business promotion at Mexico's foreign investment agency, said in an interview. "They're feeling repressed because anything they say can be used against them." GM has been clear about its investment in Mexico, starting with an announcement in late 2014 that it would spend $5 billion there. The automaker just hasn't said much about the details since then. Ford made a splash in April when, in the heart of primary season, the company said it would invest $1.6 billion in Mexico to make small cars. Ford CEO Mark Fields then said in September that the company would move all small-car production there. Trump's attacks have forced a reaction from Ford Chairman Bill Ford, who is great-grandson of the company's founder. Ford said in late September that the company makes more cars in the U.S. than any other automaker and that, "we are everything that he should be celebrating about this country." GM's investment in its factory in the Mexican state of San Luis Potosi was initially announced in November 2015, without specific plans or details. The plan came in addition to the $5 billion the company said it would invest in December 2014 to expand and retool existing plants in the country. GM says it isn't hiding its investment in Mexico. "For competitive reasons -- especially as it relates to future product -- the specific details behind the investments get rolled out as we deem appropriate," Pat Morrissey, a spokesman for the automaker, wrote in an e-mail. Morrissey also said GM has invested $20 billion in its U.S. operations since 2009 and employs 97,000 people in the U.S. and 15,000 in Mexico. In past years, GM has been vocal in promoting its new investments in Mexico. It held a ribbon-cutting ceremony for a new railway extension in San Luis Potosi in 2014, invited a governor to announce an expansion in Coahuila in 2010, and fired off press releases detailing even its smallest investments -- including an $87 million contribution to a stamping plant in March 2015. That same month it also announced a new model it would produce in Mexico: the new generation Chevrolet Cruze. By contrast, GM has no press statements on its website about investments in Mexico this year. There has been no information about the Equinox in Mexico, nor on where all of the $800 million pledged in November would be spent. The automaker has confirmed it will build the Chevrolet Equinox at a plant in Ingersoll, Ontario. GM also said it would make the Equinox and its stablemate, the GMC Terrain, at two other unidentified factories. "Companies don't halt their investment decisions for political reasons, they simply do it quietly," Chacon said. "No company wants to have big announcements now because they could see a negative reaction from unions in other countries. So decisions aren't made out in the open but they continue. They can't stop." GM President Dan Ammann had little to say about the political controversy that has embroiled Ford during election season. "We're observing," Ammann said in an interview with Bloomberg. Labor costs that are about a fifth of U.S. levels have lured most carmakers to set up shop or expand in Mexico in recent years. Since the beginning of 2010, Mexico has snared $25.8 billion in announced investments, according to the Center for Automotive Research in Ann Arbor, Michigan. Kia Motors Corp. and Volkswagen AG's luxury Audi unit inaugurated billion-dollar plants last month. A joint venture of Daimler AG and Nissan Motor Co. is working on a factory that will assemble compact vehicles, while Toyota Motor Corp. plans to produce Corollas. BMW AG is also building a plant. In addition to lower labor costs, Mexico also offers a network of international trade deals and proximity to the U.S. car market. "Mexico's free trade agreements, geography and labor costs make it more attractive than Brazil," Horacio Chavez, Kia's Mexico country chief, said in an interview last month. "It allows us to reach many markets." Did GM downplay debut of SUV to avoid Trump's wrath? If you're wondering why you haven't read a review of the Buick Envision SUV yet, blame Donald Trump. That theory has gained currency among the automotive press, and I find myself increasingly persuaded by it. General Motors has been completely open about the fact that it builds the Buick Envision in China. It is one of the first new vehicle models imported into the U.S. from China from a major automaker. The Republican nominee so politicized the auto industry this year with factually challenged attacks on Ford that General Motors may have soft-pedaled the introduction of a promising new vehicle to avoid becoming a partisan target. GM, having spent way too much time in the political cross hairs during the Great Recession, declined to comment. The Envision, if you haven’t heard of it — and you may not have, because its sales launch this summer was quiet as a ninja at midnight — is an intriguing new compact SUV. Attractive and well-equipped, it competes with small luxury crossovers like the Audi Q3, BMW X1, Lexus NX and Mercedes GLC. It has sold well and won Buick new customers since reaching dealerships in May, but the U.S. sales launch has been anything but typical. Since Envision was an addition to the Buick lineup, its Chinese production didn’t cost American jobs [U.S. production would have created jobs in the U.S. market where GM would profit from sales], and strengthens GM and Buick with sales of a vehicle they wouldn’t have without Chinese production. Yet earlier this month, Buick didn’t send an Envision to the North American Car of the Year jury’s test of semifinalists for the car, truck and utility vehicle of the year awards. The comparison drive attracted several dozen vehicles from nearly every major manufacturer. It took place among southeast Michigan lakes and woods, barely an hour’s drive from Buick headquarters on the Detroit riverfront. Hyundai, Nissan, Honda, Mercedes, Audi, Jaguar, Ford, Fiat Chrysler, Porsche, Volvo, Kia and Genesis had no trouble getting vehicles to the event, where about 40 leading journalists spent three days evaluating them. Buick’s stablemates at General Motors — Cadillac, Chevrolet and GMC — had no trouble getting vehicles to the test. Buick managed to deliver a LaCrosse large sedan, the other new model it launched this year. There are a hundred good reasons to build the Envision in China [??? ], but Ford had a hundred good reasons for moving production of the Focus compact car to Mexico. That didn’t keep Donald Trump from making Ford his piñata in a series of vituperative speeches. As GM is temporarily laying off 2000 workers and saying the 17% drop in Cadillac sales is the buyer preference for SUV's and light trucks. Toyota and Nissan Motor Co., Japan’s largest automakers, were spared from Trump’s critique by name on the campaign trail. Yet, along with General Motors Co. and VW, they all rely on Mexican plants for millions of vehicles and a high volume of parts. That puts them at risk if the president-elect makes good on his threat to levy hefty taxes on cars assembled across the Rio Grande. Since 2010, nine global automakers, including GM, Ford and Fiat Chrysler Automobiles NV, have announced more than $24 billion in Mexican investments. VW’s Audi, BMW AG and Daimler AG each build or plan to assemble luxury vehicles, engines or heavy trucks in the low-cost country, which Trump says has benefited at the expense of the American voters who propelled him to victory. Output in Mexico may more than double this decade, from 2 million to 5 million vehicles, according to the Center for Automotive Research in Ann Arbor, Michigan. The Republican candidate and real-estate developer grabbed headlines during his campaign by threatening to slap a 35 percent tariff on any cars Ford builds in Mexico and ships back to the U.S. He called Ford’s plans for a new plant in Mexico “an absolute disgrace.” A levy would lead to higher prices and hurt demand, said Joe Spak, an analyst at RBC Capital Markets. Trump would “start a worldwide trade war” if he decides to end trade pacts and uses anti-dumping provisions to impose widespread tariffs on other countries, said Donald Grimes, an economist at the Institute for Research on Labor, Employment and the Economy at the University of Michigan. The North American Free Trade Agreement (NAFTA), for example, requires only six months’ notice of termination to Canada and Mexico and doesn’t specify that the president would need congressional approval, he said. “These other countries would retaliate. Prices consumers would pay would increase sharply. The Federal Reserve would then increase interest rates. It would be ugly,” Grimes said. “We agree with Mr. Trump that it is really important to unite the country -- and we look forward to working together to support economic growth and jobs,” Ford said in a statement. The company’s plan to shift small-car production from a factory in Michigan to Mexico was attacked by Trump during his first answer of the initial debate with Democratic candidate Hillary Clinton in September. GM and Fiat Chrysler said in separate statements they would work with Trump and the new Congress on policies that support manufacturing in the U.S. “It’s obvious there is work to be done,” UAW President Dennis Williams, whose union endorsed Clinton, said in a statement. German executives attending an industry conference in Munich on Wednesday also expressed concerns about Trump’s views. BMW is building a new car plant in Mexico’s San Luis Potosi that’s due to start production in 2019, while Audi started assembling autos in San Jose Chiapa in September. For Bob Lutz, the retired vice chairman of GM, Trump’s victory could ultimately help the auto industry if his advisers and Congress keep him from pushing his protectionist agenda too far. Rather than threaten Japan auto imports with tariffs, Trump has pointed to wealth generated from the cars being sold in the U.S. to bolster his argument for America to pay a smaller share of the costs related to stationing troops in its biggest Asian ally’s territory. Japan’s automakers have combined capacity to build about 1.36 million vehicles annually in Mexico and have announced plans for new plants capable of assembling another 430,000 vehicles a year. Models built or planned for Mexican production and sale in the U.S. include the Toyota Corolla, the Nissan Versa and Sentra, and the Honda Fit and HR-V.
General Motors will lay off 2,000 employees at two car plants in the US Midwest, the latest sign that the US car industry is suffering from softening demand, especially for some smaller models. GM said in a statement on Wednesday that it will cut the third production shift at plants in Lordstown, Ohio and Lansing, Michigan early next year. These plants build some of the slower-selling small car models in the GM stable at a time when demand for trucks and sport utility vehicles continues to be strong. The announcement, made on the morning after Donald Trump’s stunning victory in the US presidential election, did not appear to be election-related. Other US carmakers, including GM’s rival Ford, have recently announced production cutbacks in response to falling demand as the US car market hits its peak after seven years of rapid post-recession growth. The Lansing Grand River plants makes Cadillac ATS and CTS models as well as the Chevrolet Camaro, while the Lordstown facility produces Chevrolet Cruz sedans. While reducing the shifts will affect 1,243 and 840 hourly and salaried workers, respectively, GM said it will invest $900 million in three of its plants, including Lansing Grand River, to prepare for future product programs. The shifts come in response to changing consumer demand, GM said, as customers increasingly favor crossovers and trucks instead of cars. GM has been more bullish than other carmakers about the strength of the US market, leading investors to worry that it could end up with a glut of product, especially unpopular smaller models. “As expected, GM is cutting production of slower-selling cars so as not to build up inventories that require big incentives to move. This is evidence of the continuing and enormous shift of consumers buying far more utilities than traditional cars,” said Michelle Krebs, senior analyst at Autotrader. “This comes on the heels of Ford making similar cuts with cars in the same categories,” she said. But news of job cuts could further inflame President-elect Donald Trump’s rhetoric about the need to keep carworker jobs in America. Yesterday, a senior GM executive defended the company’s use of Mexican plants, indicating it will not yield to political pressure to relocate manufacturing jobs to the US. Not surprised that the automakers are not overjoyed with Trump. With the Obama administration they at least knew what emissions and fuel economy standards they had to meet, and could plan for them. Now Trump comes along and wants to dump those standards after they've spent millions to meet them, while threatening to put oppressive tariffs on any Mexican content. Worse yet, Trump threatens to saddle the U.S. with even more oddball standards that are out of step with the rest of the worlds. Heck, Canada and certainly California certainly won't go along with Trump's regulatory rollbacks, throw in Mexico and that leaves manufacturers to deal with 4 sets of standards on one continent. Consider for a moment that even if Trump rolled back diesel emissions standards to pre 2001, Most of the diesel trucks on the market today came to market since 2001 and were never engineered to accommodate pre 2001 engines. And they're going to engineer pre 2001 engines into their current trucks for just half the already oddball U.S. market? Fat chance! I would think if anything, might there be some effort to roll back the compliance dates a bit? The objectives might be good, but are the compliance dates unrealistic? I would think with more time the industry might be able to develop a better end result. 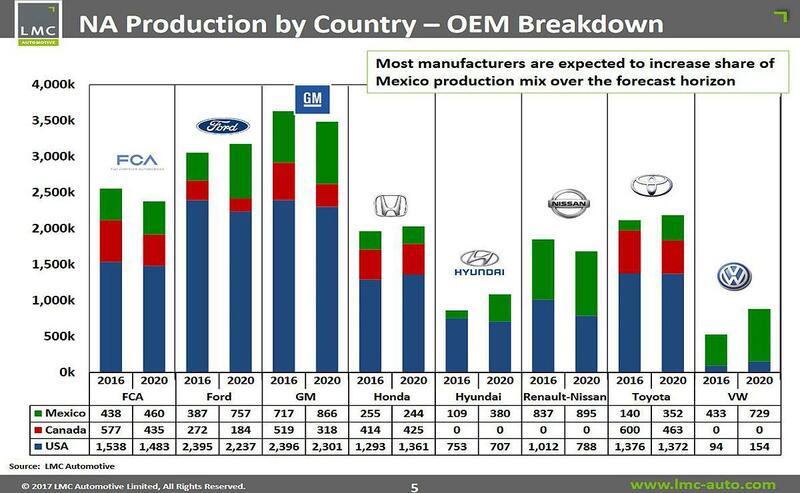 On another note, all the discussion seems to involve auto production in Mexico. What about trucks?? Are not all Rams/Mopars/Dodges built in Mexico? A lot of Freightliner production? A lot of Navistar production? As with a lot of issues, Trump will have to depend on the good people he brings on board for advice-I hope! Just saw a Jack Welch interview that seemed upbeat on just where the "real" Trump will be headed. Rolling back compliance dates, rolling back MPG requirements and eliminating EPA fines for not using a non existent Bio additive would help. Also why if the emission regs are rolled back do manufacturers need to stop using current technology that monies have been spent to develop? Does the UAW and others have inside info? Seems that everyone is pretty quick to condemn his presidency with out him even taking the oath of office yet. Maybe he should be given the same chance that HRC would be given. Course I'm a deplorable so I know crap. I'm not putting a partisan spin on this, just taking a practical view of what will probably happen. I think Trump and the republican congress may cancel or repeal the future fuel economy standards and electric car tax credits, but a rollback to the previous 2007, 2004, or 2001 standards is unworkable. The tooling for the E7 is probably gone, Daimler's Cascadia came out in 2007 and was never designed for earlier engines, Paccar's new conventional is now over half their production and the old one is being phased out, and it was designed only for 2010 and newer engines. IIRC Volvo's pre-2004 engines were pretty much a whole different design, and International's MAN based engine was never sold in pre-2007 form, IIRC. Cummins could probably still build an EPA 2004 engine, but I doubt they 'd want to go through the hassle for such a small market. On the positive side, I suspect Trump's EPA administration will end the war on diesel and I'll be able to buy a new diesel car to replace my TDI when they buy it back. Jody Fledderman is one of five original employees at the auto-parts factory his father founded in rural Batesville, Ind. He also spends a lot of time at the company’s 97,000-square-foot plant in central Mexico. The two operations have expanded together as automotive production in both countries boomed. Mr. Fledderman credits the success of Batesville Tool & Die Inc., where he is president, in part to the addition of a Mexican plant 16 years ago that helps service Honda Motor Co., Nissan Motor Co. and other clients on both sides of the border. “We have three or four clients back in Indiana that we wouldn’t have had if we weren’t here,” Mr. Fledderman, 54 years old, said in an interview at the plant in Querétaro. President-elect Donald Trump has said that in his first days in office he will begin renegotiating the North American Free Trade Agreement, which connects Canada, the U.S. and Mexico, and leave the pact if Mexico doesn’t agree to improved terms for the U.S. He blames unfair trade, in particular with Mexico and China, for the loss of millions of factory jobs. Ending the 1994 trade pact is relatively easy. The U.S. legally can pull out of Nafta six months after Mr. Trump as president notifies Mexico and Canada of his intention to do so, according to a September study by the Peterson Institute for International Economics in Washington. Imposing tariffs on imports lies within the authority of U.S. presidents. For the auto industry, as Mr. Fledderman’s business shows, such a change would be substantially more complicated, because of the multilayered connections between U.S. and foreign suppliers and assembly points. The tens of thousands of parts that make up any vehicle often come from multiple producers in different countries and travel back and forth across borders several times. This is a tenet of modern manufacturing: Where a product is ultimately assembled increasingly has little bearing on where its component parts are made. Assembly plants are prized engines of local economies because they tend to pay better than most factories. Mr. Trump has repeatedly criticized Ford Motor Co.’s plan to move assembly of its Focus compact from Wayne, Mich., to Mexico, vowing to impose a steep tariff on the car if Ford follows through. Ford executives have said moving the Focus to Mexico won’t result in American job losses and that the company remains committed to producing in the U.S. But more than half the parts in the Focus today are made outside the U.S. and Canada, including 20% in Mexico. Ford also ships in some of the car’s engines from Spain and transmissions from Germany. Similarly, only 10% of the parts that go into the 200,000 BMW luxury crossovers built each year in Spartanburg, S.C., come from U.S. and Canadian plants, according to U.S. government data. The rest are imported from Europe and elsewhere. BMW in turn exports most of the Spartanburg plant’s production around the world. By contrast, 70% of the components in the Honda CR-Vs assembled in Guadalajara, Mexico—the production of which soon will be moved to central Indiana—are currently made by U.S. and Canada-based factories, data show. The parts that make up a car or truck, from bolts to motor blocks, window lifts to oil filters, account for two-thirds of its value, according to the Motor & Equipment Manufacturers Association, a trade group. U.S. assembly plants vary on the amount of U.S.-made components they use. A Chevy Silverado pickup built in Indiana has 51% parts content from Mexico, according to the window sticker, while Ford’s exclusively U.S.-assembled F-Series truck, the country’s top selling vehicle for 39 years straight, has 70% U.S. and Canadian content. “This industry, particularly in North America, has integrated a lot,” said Thomas Klier, an economist at the Federal Reserve Bank of Chicago who specializes on automotive supply chains. Such integration poses a challenge for anyone wanting to buy an entirely U.S.-made vehicle. “You can’t buy an American-made car anymore. You can buy an American-assembled car,” said Loren Baisden, 32, a 13-year veteran of Ford’s assembly line now working at the company’s heavy-truck chassis plant in Avon Lake, Ohio. 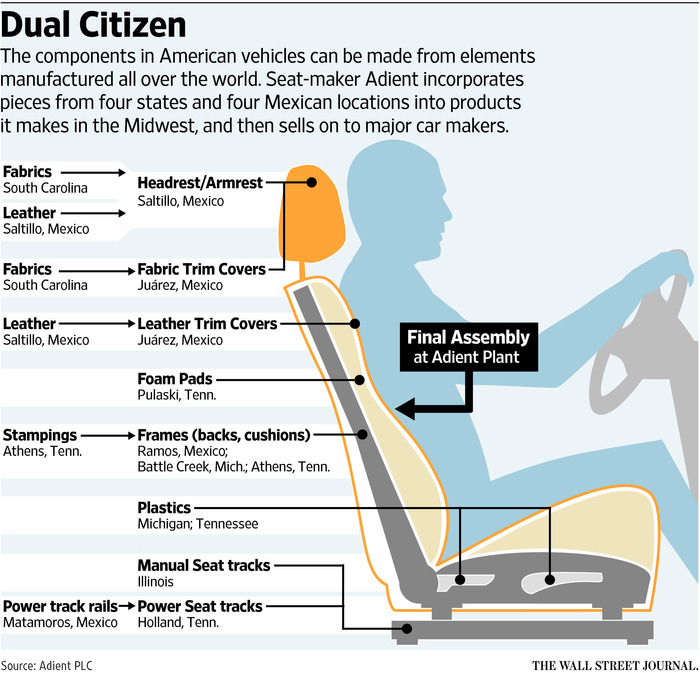 Auto makers and many primary suppliers have moved some high-tech production to Mexico and elsewhere. Lower-tier suppliers typically relegate labor-intensive production such as assembling wire harnesses or sewing materials for seats to low-wage Mexico plants while keeping more highly skilled and automated tasks at their U.S. factories. That strategy allows auto makers and their suppliers to be cost competitive with Asian and European imports, analysts say. Still, with so much final assembly moving to Mexico, the epicenter of North American auto production, which for more than a century has been deeply rooted in the Midwest, is moving an average of 14 miles toward the Southwest annually, according to a 2014 analysis by IHS Markit Automotive Advisory, the consultancy. The neighboring small Indiana cities of Anderson and Muncie, which straddle Interstate 69 less than hour’s drive north of Indianapolis, have been suffering that migration for more than three decades, as General Motors Co. and its suppliers have decamped for the south. The cities collectively have lost tens of thousands of high paying factory jobs. Mursix Corp., a family-owned supplier company on the edge of Muncie, has been under increasing pressure to move some operations to Mexico to be closer to big Japanese and U.S. firms located there. The maker of switches, connectors and other electronic components exports about 60% of what it produces, primarily to Mexico, company president Todd Murray said. The company is losing two product lines to suppliers located near his customers’ Mexico plants, he said. Mr. Murray said Wednesday that if a Trump administration overhauls or scraps Nafta, and gets tough with China, it could ultimately help him fend off that competition. In the short run, he said, the healthier operating margins available to companies producing in Mexico will outweigh any new U.S. import duties. With the right policy mix, including lower corporate taxes, Mr. Murray said, any profits from Mexico operations could be invested to create cutting-edge technology jobs in the U.S.
U.S. and Canada-based factories shipped nearly $29 billion worth of parts to Mexico in 2015, according to INA, the Mexican auto-parts industry’s national association. Mexican plants in turn sent more than $61 billion worth of parts to the two Nafta partners, accounting for much of the trade surplus Mexico has with the U.S.
About a third of Mexico’s 1,300 suppliers, which employ some 720,000 people, are U.S. owned, according INA. Mexican, Asian and European companies make up a growing share of U.S.-based suppliers, which the U.S. Labor Department says provide jobs for nearly 600,000 Americans. Mr. Fledderman’s Batesville Tool & Die produces an array of components for the automotive, appliance and other supply chains. The 38-year-old company is a primary supplier to Honda and makes parts for Swedish air bag maker Autoliv AB, currently its biggest Mexico customer. Some components, including engine hood hinges, oil filter seals and air bag parts, are made on both sides of the border to be closer to customers who demand quick and reliable delivery of parts. The plant in Batesville, a town of 6,000 staked amid the corn and soy fields of hilly southern Indiana, also handles product design and employs robots and a 3-D printer to make more intricate or larger parts. The Batesville factory has expanded five times in recent years as the company’s North American business has surged. The company now employs 800 people, evenly divided between its two factories, and has annual revenue of $130 million, up from $8 million in 1989, when Mr. Fledderman took over. 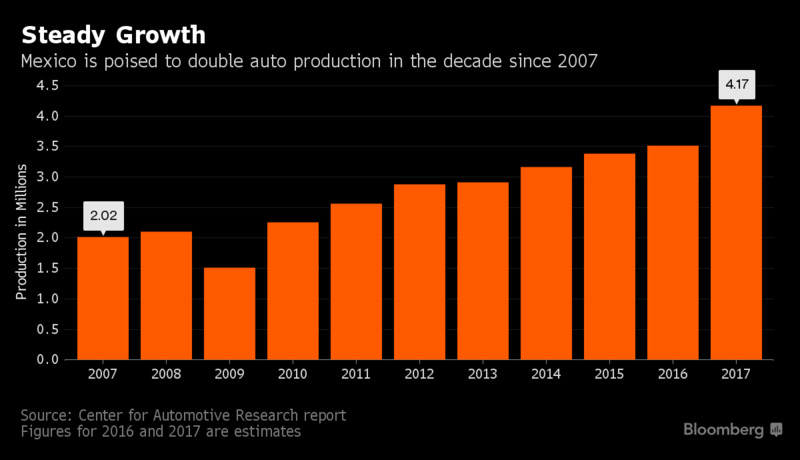 Auto production in Mexico by U.S., Asian and European auto makers has boomed in the past decade, nearly doubling to reach 3.4 million light vehicles last year. Despite the surge in Mexico, nearly 60% of the 17.5 million light vehicles sold in the U.S. last year were assembled within a so-called auto alley that runs from the Great Lakes to the Gulf of Mexico, said James Rubenstein, a geographer at Miami University of Ohio who writes extensively about the industry. Imports from Nafta partners Mexico and Canada, which contain a heavy mix of North American made parts, account for much of the rest. The auto-parts industry alone accounted for about 14% of the $531 billion in U.S.-Mexico trade in 2015, according to U.S. government data. In Anderson, Ind., a business incubator and economic development project known as the Flagship Enterprise Center—a joint effort by the city government and Anderson University financed in part with federal grants—tries to attract industrial investment and to foster development of advanced technology, such as electric automotive engines. So far, 17 foreign companies, including Swiss foods giant Nestlé SA and NTN Corp., the Japanese drive shaft maker, have located plants in the city, only a few them tied to the automotive industry. Purdue University, which has one of the largest U.S. engineering programs, plans to open a polytechnic campus next spring on land where a GM plant once stood. Major automakers are seizing on the infancy of President-elect Donald Trump’s administration to mount a push to ease regulatory headaches faced under President Obama. In a letter to Trump’s White House transition team today, the Alliance of Automobile Manufacturers proposed that the new administration pause a key step in the ongoing midterm evaluation of the Obama administration’s 2025 fuel economy and greenhouse rules until Trump’s administration can “lead efforts” with regulators and automakers on “a pathway forward” for the final four years of the rules. The Alliance called the rules, which become increasingly stringent starting in model year 2017, a “substantial challenge” for the industry. While the industry has expressed support for the broader efficiency and environmental goals of the program, automakers are concerned about the timing and costs of the rules, which will require billions of dollars in investment. The proposal is among a series of policy and regulatory recommendations submitted to the Trump transition team aimed at streamlining the industry’s regulatory obligations. Taken together, they signal that automakers view the early stages of Trump’s administration as a key opportunity to secure regulatory reforms that they say create friction and drive up vehicle costs. “We live at a moment where technology and change are swamping the regulatory capacity to manage our emerging reality. Reform is imperative,” Alliance CEO Mitch Bainwol said in the letter, obtained by Automotive News. Trump himself has vowed a broad review of existing regulations that threaten jobs and a moratorium on all new regulations. The Alliance called for a comprehensive review of all regulatory and policy actions by the Obama administration since Sept. 1. This would include the Transportation Department’s guidelines for autonomous vehicle deployment. It also proposed the creation of a new "presidential advisory committee" to coordinate the many federal agencies that oversee parts of the industry such as the EPA, National Highway Traffic Safety Administration, Federal Trade Commission, Federal Communications Commission, Consumer Financial Protection Bureau and others. The Alliance said the committee could recommend a “new paradigm” for vehicle regulation. Much of the Alliance’s letter focuses on changes to the so-called National Program of joint greenhouse gas rules administered by the EPA and mpg standards overseen by NHTSA. The coordinated regulations were put into effect by the Obama administration in the 2012 model year. The Alliance says discrepancies between the two programs have led to unneeded costs and make it possible for an automaker to comply with the EPA’s CO2 limits but risk paying noncompliance fines under NHTSA’s program. In the Trump letter, the Alliance called on the Trump administration to back agency and legislative changes to iron out those differences. An EPA spokesman refused to comment. The trade group also wants costs incurred from California’s zero-emission vehicle (ZEV) sales mandates to be considered in the midterm evaluation of the national mpg program. They currently are not factored in. The California requirement, which is followed by nine other states, requires that 15 percent of sales in California be zero-emission vehicles like battery-electrics or hydrogen fuel cell by 2025. California has supported the mandate with tax incentives and other programs but other states haven’t followed suit, leading to “dramatically” different ZEV purchase rates outside of California, the Alliance said. “The Administration should engage as appropriate to help address these ZEV issues -- especially to help avoid the creation of a patchwork of requirements that will frustrate the overall intent of the ‘One National Program,’” Bainwol wrote. Greenhouse gas and mpg targets through model year 2021 are already on the books. A required midterm evaluation is underway to determine whether proposed mpg and greenhouse gas standards through 2022 are appropriate, or if they should be changed. The next step in the evaluation comes in 2017, likely midyear, when the next EPA administrator will propose whether the standards are appropriate or should be changed, which would kick off a rulemaking process. A final determination is due by April 2018. The Alliance argues that that proposed determination shouldn’t happen until Trump’s administration has had a chance to review the regulations, and can lead talks between regulators and automakers about the final years of the program, which currently aim for a fleet average of more than 50 mpg. A Technical Assessment Report issued by the EPA about the 2025 rules found that automakers were on track to comply and adopting technologies to boost efficiency and reduce greenhouse gas emissions faster than anticipated. The Alliance believes that the report “over-projects” the benefits of certain technologies and fails to fully consider consumer acceptance and market factors. “The combination of low gas prices and the existing fuel efficiency gains from the early years of the program is undercutting consumer willingness to buy the vehicles with more expensive alternative powertrains that are necessary for the sector to comply with the more stringent standards in out-years,” Bainwol wrote. The 2025 fuel economy and greenhouse gas rules are a cornerstone of President Obama’s effort to combat climate change. Trump meanwhile has said he believes climate change is a hoax and indicated he’d pare back EPA regulations aimed at reducing carbon emissions. Any weakening of the 2025 standards will be met by stiff opposition from environmental groups, who’ve broadly championed the Obama administration policy. Automakers are seizing on what they see as a fresh opportunity to recast the industry's relationship with the federal government. Within a day of Donald Trump's surprise victory last week, the Alliance of Automobile Manufacturers was handing the president-elect's transition team its wish list of policy priorities and calling for "a new paradigm for vehicle regulation." If those wishes come true, it could recast how autos are regulated by the federal government and provide relief from regulatory friction that the group says drives up vehicle costs. The alliance says the industry's policy agenda hasn't changed. But its prospects for advancing that agenda have, and the response could come quickly. For the first time in a decade, a Republican president will be working with a GOP Congress -- fractured as it may be -- a clear runway that may not be available in two years. The potential for regulatory relief goes beyond agencies such as the EPA and the National Highway Traffic Safety Administration. In its letter, the alliance cites the full complement of agencies with roles that touch on the auto sector -- from the Federal Trade Commission to the Department of Homeland Security -- in its bold call for a presidential advisory panel that would coordinate directives from all of them. The opportunity arises at a time when the industry least expected it. One government-affairs executive told Automotive News that auto executives here broadly expected a Hillary Clinton victory and bet that the next administration would presumably hew close to the direction set by President Obama on big-ticket issues such as fuel economy and greenhouse-gas standards and autonomous-vehicle policy. The prospect of a President Trump, the executive said, "was always kind of laughed off." But now, the executive said, "it's time to kind of re-gather our thoughts on these things that the Democratic administration has been pushing the industry towards and that the industry was reluctantly moving towards." One major example of that rethink surrounds the administration's approach to the fuel economy and greenhouse-gas regulations. On the eve of the election, an alliance memo to its membership on the implications of potential outcomes said "all bets are off" if Trump were to win. Under one scenario outlined by the alliance, Trump could follow through with his campaign rhetoric about hobbling the EPA -- which oversees the corporate average fuel economy program with NHTSA -- and "blow up the agreement entirely," the pre-election memo said. Another scenario, the one preferred by the industry, would be for the Trump administration to work with automakers and Congress to "adjust the program" in light of lower gasoline prices, the alliance said in the memo. The dueling scenarios illustrate the high degree of uncertainty surrounding what to expect from Trump's administration. His campaign was built around his business experience but also included populist themes and promises to sweep out the influence of special interests while making better deals on behalf of the nation. How that will translate into policy choices is anyone's guess. "If in fact he translates that campaign rhetoric to policy, he offers those who don't support the regulations some opportunities," a second industry government-affairs executive said. The alliance is diving into those opportunities. It wants a full review of all regulatory and policy actions by the Obama administration since Sept. 1 and more attention to the economic impact of regulations on the health of automakers. "We live at a moment where technology and change are swamping the regulatory capacity to manage our emerging reality," alliance CEO Mitch Bainwol said in the letter, obtained by Automotive News. "Reform is imperative." The unfurling political landscape is in a sense the inverse of what the industry faced in 2009, when Obama came to office with a Democratic Congress at his back. At that time, the industry was close to drowning, and the administration had the only life preservers. Naturally, there were strings attached. A strong advocate for climate-change action, Obama built into his auto industry reform agenda the most significant increase to fuel economy standards in years and later, the first-ever greenhouse-gas limits imposed on autos, a major victory for environmentalists and climate-change policy advocates. Now, under a GOP-controlled Congress and a presumably business-minded administration, market forces and economic impacts will take on greater weight as the fuel economy standards undergo a midterm evaluation. That could lead to a more workable program for the industry, which has struggled to reconcile the push for higher fleetwide fuel efficiency with consumer preferences for large vehicles. But a wholesale rollback of the program would be difficult. The process behind it requires that outcome of the midterm review be based on rigorous analysis of data and science. In addition, NHTSA is bound by law to set CAFE standards at the maximum feasible level. Any change in the standards -- to toughen or weaken them -- must withstand a challenge in court from either the industry or environmental lobby. Luke Tonachel, director of the Clean Vehicles and Fuels Project at the Natural Resources Defense Council, wrote in an email that "if the Trump administration seeks to roll back fuel efficiency standards, which are highly popular with the American people and even have been supported by the auto industry, it will find us standing in the way." Michael Brune, executive director of the Sierra Club, signaled a harder line, pledging to give "President Trump the hardest fight of his life every step of the way." A weakened national standard also would pose major risks for the industry. California regulators agreed to align their greenhouse-gas rules with the federal program in 2011, a major reason why the pact drew strong support from the auto industry. A weakened federal policy could prompt the state's powerful Air Resources Board to go rogue and institute even tougher standards for the nation's largest auto market to compensate for a relaxation of standards at the federal level. To head that off, one industry insider here suggested, automakers could rally behind the 2025 standards to ensure that the industry at least has a consistent, national program. "Even if you can do it," the insider said of diluting the 2025 standards, "should you do it?" Ford is moving ahead with plans to shift production of small cars to Mexico from Michigan, while "two very important products" will be built in its U.S. factories, CEO Mark Fields told Reuters on Tuesday. "We’re going forward with our plan to move production of the Ford Focus to Mexico, and importantly that’s to make room for two very important products (Ranger and Everest) we’ll be putting back into Michigan plants," said Fields. "There will be no job impact whatsoever with this move." Ford Chairman Bill Ford Jr. said last month he met with Trump. Ford has countered Trump's criticism, saying the company makes more cars and trucks in the United States than any other automaker. United Auto Workers leaders huddled with Ford Motor Co. executives today after the union was caught off guard by President-elect Donald Trump’s tweet last night he helped prevent another Ford model from going to Mexico. While the union is pleased Ford has now committed to continue building the Lincoln MKC small sport utility vehicle at a Kentucky factory, Trump’s tweets had suggested that the entire Louisville Assembly Plant’s output was under threat of moving to Mexico. The MKC is built on the same assembly line as the Ford Escape, which outsells the Lincoln version by 12-to-1. More than 5,000 employees are working nearly around the clock on three crews to meet demand for the two SUVs, said Todd Dunn, president of UAW Local 862 in Louisville. So were Trump’s tweets that there would be “no Mexico” because he “worked hard with Bill Ford to keep the Lincoln plant in Kentucky” misleading? Ford didn’t inform the union of its long-term plans for the MKC before those tweets went out Thursday night, Dunn said. That’s what UAW Vice President Jimmy Settles, who oversees Ford contract negotiations, and other union leaders were planning to discuss with the company today, he said. Settles and Ford manufacturing chief Bruce Hettle sent a letter to Louisville plant workers Friday promising to meet with them “in the coming days” to discuss the change in plans on the MKC. After Trump’s tweets, the company acknowledged for the first time it had been considering moving production of the MKC to Mexico, allowing the plant to boost output of the Escape, one of its hottest models. After talks between Executive Chairman Bill Ford and the president-elect, the automaker decided to keep building the MKC in Louisville after the UAW’s current contract expires in 2019. “We had planned to move the Lincoln MKC out of Louisville Assembly Plant,” Christin Baker, a Ford spokeswoman, said in an e-mail, noting the UAW contract signed last year allowed for such a move. "Cuautitlan plant in Mexico was likely the plant for MKC." During his campaign, Trump was relentless in his criticism of Ford for planning to move all its North American small-car production to Mexico, where wages are 80 percent lower than in the U.S. Ford also builds the Lincoln MKZ sedan at a factory in Hermosillo, Mexico. During the campaign, Trump threatened to slap Ford’s Mexican-built cars with a 35 percent tariff. He also said he would terminate the North American Free Trade Agreement, which lets goods flow between Mexico, the U.S. and Canada without tariffs. Ford, which has expressed a willingness to work with Trump since he was elected, has been in "constant contact" with his transition team, Chief Financial Officer Bob Shanks told analysts Thursday. Ford’s change of heart on moving the MKC to Mexico followed those discussions. “We are encouraged that President-elect Trump and the new Congress will pursue policies that will improve U.S. competitiveness and make it possible to keep production of this vehicle here in the U.S.,” the automaker said in an e-mailed statement after Trump’s tweets. Bill Ford met with Trump during the campaign in an unsuccessful attempt to get the candidate to stop targeting the automaker, which says it has created nearly 28,000 jobs in the U.S. during the past five years. In his first answer of the first debate with Democratic candidate Hillary Clinton, Trump attacked the automaker for plans to move production of the Focus small car and C-Max hybrid from a plant in Michigan to Mexico. U.S. Environmental Protection Agency chief Gina McCarthy on Friday finalized a determination that the landmark fuel efficiency rules instituted by President Barack Obama should be locked in through 2025, a bid to maintain a key part of his administration's climate legacy. Major U.S. and foreign automakers have appealed to President-elect Donald Trump, who has been critical of Obama's climate policies, to review the rules requiring them to nearly double fleet-wide fuel efficiency by 2025, saying they impose significant costs and are out of step with consumer preferences. As part of a 2012 regulation, EPA had to decide by April 2018 whether to modify the 2022-2025 model year vehicle emission rules requiring average fleet-wide efficiency of more than 50 miles per gallon. In November, the agency moved up the timetable for proposing that automakers can meet the 2025 standards. McCarthy said in a statement her determination, a legally binding decision to maintain the fuel efficiency rules, rests on an extensive technical record. "At every step in the process, the analysis has shown that the greenhouse gas emissions standards for cars and light trucks remain affordable and effective through 2025, and will save American drivers billions of dollars at the pump while protecting our health and the environment," she said. Gloria Bergquist, a spokeswoman for the Alliance of Automobile Manufacturers, a trade association representing General Motors, Ford Motor Co., Toyota Motor Corp., Volkswagen AG and others, criticized the decision. "Our fundamental priority remains striking the right balance to continue fuel economy gains and carbon reduction without compromising consumer affordability and vital auto-sector jobs," she said. Automakers hope to work with regulators and California, Bergquist said, "to see whether we can find a prudent compromise path forward that avoids an unnecessary and counterproductive regulatory collision." “The Obama Administration today just made new cars and trucks thousands of dollars more expensive for America’s working men and women," NADA CEO Peter Welch said in a statement. Legal experts have said it will be more difficult for the Trump administration and Congress to undo the determination than to unwind other regulatory actions issued by the Obama administration during its final months in office. The 2025 determination is not a new regulation, so the EPA, under Trump, would likely have to go through an extensive process before withdrawing the determination, and could face lawsuits from environmental groups if they took that step. The Trump administration is signaling Canada could face the same retaliatory trade measures as Mexico, in what would be an even bigger disruption to automakers such as Toyota Motor Corp. and Fiat Chrysler Automobiles NV. Any move to thwart imports from Canada would be a more severe impediment to the North American auto sector than sanctions against Mexico, since the industry’s links with the U.S.’s northern neighbor run deeper. Assembly in Canada, which along with the U.S. is a higher-cost producer than Mexico, is also focused on the more profitable and faster growing light-truck and sports vehicle segment of the market. Through October, the U.S. imported $37 billion worth of passenger cars from Canada last year, a 12 percent increase, according to Bloomberg Intelligence. That compares with $19 billion in imports from Mexico, which have been on the decline. Michigan-based automakers such as Ford Motor Co. often ship parts back and forth across the border to factories in Ontario, and made commitments to invest in Canada earlier this year while finishing union contract negotiations. The auto industry is global in nature and all vehicles contain a percentage of non-domestic content, Toyota Motor Corp. spokesman Aaron Fowles said in an emailed statement. This type of tax will have an impact on every part and product that is imported to the U.S., which means that prices for all vehicle makes will increase, according to the statement. While Canadian policy makers have already begun worrying how Trump policies will factor into their economic forecasts, Prime Minister Justin Trudeau’s government has sought to get ahead of any potential trade disputes, pledging to work with the new administration and even renegotiate the North American Free Trade Agreement. This week, he confirmed his officials have met with Trump’s team to boost trade ties. The Canadian government also doesn’t lose any opportunities to highlight that its trade with the U.S. is near balance. The U.S. rang up a $9.1 billion merchandise trade deficit with Canada through November of last year, lagging the Mexican shortfall of $58.8 billion. Mexico has also moved ahead of Canada as a supplier of products to the U.S. in recent years on the strength of growing investments in auto factories there. Up to now it’s worked, with the president-elect focusing most of his calls for fair trade on Mexico and China. Spicer’s comments represent the first major broadside from Trump’s office against Canada, which generates $541 billion worth of annual trade with the U.S. Earlier this week, Montreal-based National Bank Financial estimated a 10 percent tax on goods crossing the American border would knock 9 percent off the value of Canada’s exports there. This is so much more than a parting shot. With a week to go before Donald Trump becomes president, the Obama administration has unleashed a final, multiprong effort on enforcement and regulation in the automotive industry, with Fiat Chrysler Automobiles NV now at the fore. On Friday alone, the U.S. Environmental Protection Agency rejected automakers’ bid to weaken fuel-efficiency standards, news broke that federal authorities had opened a criminal investigation into Fiat Chrysler over its handling of emissions in 104,000 SUVs and pickup trucks, while embattled supplier Takata Corp. agreed to plead guilty and pay $1 billion to settle a U.S. probe into its exploding airbags linked to at least 17 deaths worldwide. Together the developments -- along with this week’s $4.3 billion in fines and penalties against Volkswagen AG for its diesel-emissions cheating and the indictment of three Takata executives -- mark one of the most aggressive industry-related moves since the Obama administration helped General Motors Co. and the former Chrysler LLC through bankruptcy in 2009. The question now is how Trump, who campaigned on promises to revive the fossil-fuel industry and roll back environmental regulation, will respond to steps the auto industry says will hurt jobs and cost consumers. Sergio Marchionne, the chief executive officer of Fiat Chrysler, told reporters on Friday the Obama administration has taken a “belligerent view” of the industry. “We don’t belong to a class of criminals,” he said. The administration’s biggest move was EPA jumping several months ahead of schedule to affirm President Barack Obama’s mandate requiring automakers to cut carbon-dioxide emissions by boosting their fleet-wide fuel economy to an average of 50.8 miles per gallon by 2025 from 35.3 mpg now. National Automobile Dealers Association President and CEO Peter Welch urged Trump to reverse the EPA decision, saying in a statement the rule would add thousands of dollars to the cost of new cars and trucks. Welch’s comments echo the auto industry’s broader tone since Nov. 30, when the EPA telegraphed that the regulations would see no major changes. Friday’s announcement marked the conclusion of an EPA review automakers say was unfairly cut short to safeguard a signature Obama administration environmental policy from Trump. “Obama is making it more difficult and more politically costly for the new administration to unwind the regulations,” said Brian Johnson, a Barclays Plc analyst in Chicago. For Trump to do this, he would have to re-start the process that produced the rules in the first place. Dave Cooke, senior vehicles analyst at the Union of Concerned Scientists, says such a move would include reaching a fresh conclusion that the 2025 standards needed to be changed and then a lengthy rulemaking to actually do so. Washington-based analysts at ClearView Energy Partners LLC issued a note to clients on Friday, saying Congress probably won’t roll back the regulations. “We think the Trump Administration may be more inclined to consider short-term administrative ‘tailoring’ of the program to give automakers more flexibility as it considers a comprehensive rewrite of the MY2022-2025 standards,” it said. The Republican-controlled Congress also could amend the Clean Air Act to bar the regulation of carbon dioxide as a pollutant, or to prevent California and other states from enacting their own requirements for zero-emission vehicles. As part of a rulemaking slated for later this year, the National Highway Transportation Safety Administration will codify its own fuel-economy targets for 2022-2025. The Trump administration could use this to grant concessions automakers want related to, for example, credits they can earn by installing eco-friendly technologies such as aerodynamic grilles. Relief on these rules is near the top of automakers’ wish lists for what they hope will be a more business-friendly administration under Trump. In an interview at the Detroit auto show earlier this week, GM North America President Alan Batey expressed concern the current targets force companies to add expensive equipment he said “the customer won’t pay for and, in many cases, doesn’t even value.” A longer timeline would relieve some of the pressure, he added. Beyond fuel economy, automakers petitioned Trump’s transition team for a broader re-set of relations with the government just days after the election, asking for a new presidential advisory panel to coordinate the panoply of regulatory agencies that oversee pieces of the industry. Yet the impact of even an aggressive move by Trump to de-fang Washington’s auto-regulatory regime may have limits, as counterparts overseas show no signs of backing off their own initiatives. Trump’s election has alarmed climate activists who worry the president-elect will make good on his vow to dismantle environmental regulations limiting carbon-dioxide emissions. Trump once described climate change as a hoax, and many of his nominees for key cabinet positions also have been skeptical of humans’ role in the phenomenon. Fears also have been stoked by a questionnaire Trump transition advisers sent to the Energy Department in December, asking for the names of employees and contractors involved in climate policy matters. Given the volume of emissions from America’s 250 million vehicles, Obama’s fuel-efficiency plan is widely considered to be one of the country’s major efforts to combat climate change. For now, automakers don’t know if Trump is spending much time even thinking about how to regulate their industry. General Motors today said it would invest $1 billion in its U.S. manufacturing operations to create or retain 1,500 jobs in this country. GM, in an announcement timed to ease pressure from President-elect Donald Trump, also said it would move production of pickup axles from Mexico to Michigan and create at least 5,000 more U.S. jobs in other parts of its business during the next few years. GM did not say how many of the 1,500 manufacturing jobs would be new as opposed to positions that otherwise would have been outsourced or eliminated without the investment. The company said insourcing axles for the next generation of its full-size pickups, expected to debut in 2018, would create 450 jobs in Michigan. Trump indirectly referenced GM’s investment in a series of Twitter posts about 30 minutes after the company’s announcement. The news comes three days before Trump’s inauguration and follows similar investment announcements from Ford Motor Co. and Fiat Chrysler Automobiles. Trump, in a nationally televised news conference last week, praised those companies and said he hoped GM would follow suit. “I think they will be,” Trump said Jan. 11, though it was unclear whether he had knowledge of GM’s plan or if he was merely encouraging GM to do so. He told a German newspaper Bild that Germany had an unfair relationship with the U.S. because Germans don’t buy Chevys at the same rate that Mercedes-Benz sells in the U.S. GM dropped the Chevy brand in Europe in 2015 to focus on Opel instead. GM said the investment is on top of $2.9 billion announced for its U.S. operations last year and $21 billion invested in its home country since 2009. In the past four years, it said it has created 25,000 U.S. jobs, including 6,000 hourly manufacturing positions and added nearly $3 billion in annual wages and benefits to the U.S. economy. Barra, who has been chosen to sit on an economic advisory panel to Trump, last week said she was looking forward to showing GM’s contributions to U.S. employment as the new administration considers any new manufacturing policies. In addition to its own axle-making jobs, GM said one of its suppliers has committed to moving 100 jobs from Mexico to build unspecified components for the next-generation pickups in Michigan. UAW-GM Vice President Cindy Estrada, in a statement, said the GM announcement stemmed from the company's 2015 union contract agreement. “Today’s announcement continues GM investments that have emerged as a result of the 2015 national bargaining agreement. We are pleased that there will be over $1 billion in new investment for current and future UAW GM members. Through hard work and the quality products we build, UAW-GM members, their families and their communities will benefit. "We will continue to work with GM to bring more product to the United States and enhance the job security of our UAW members." Mexico has been the central focus of Trump’s criticism of GM and other automakers. In a Jan. 3 post on Twitter, Trump said GM should pay a “big border tax” to import Chevrolet Cruze hatchbacks from Mexico. He made that threat just hours before Ford said it was canceling a $1.6 billion plant in Mexico and instead expanding a plant in Michigan. FCA later said it would spend $1 billion to add 2,000 jobs in Michigan and Ohio. General Motors Co. will build axles for its next-generation full-size pickups at its Grand Rapids components plant, a move that is tied to investment and jobs that the automaker announced more than 18 months ago, according to two sources familiar with the automaker’s plans. The automaker said Tuesday it will add thousands of new jobs in the next few years, including in-sourcing axle work from a supplier that includes work now done in Mexico. GM said the move to operations in Michigan would create 450 U.S. jobs. A GM spokeswoman on Tuesday declined to name the supplier or where or when those jobs would come to the U.S. However, American Axle & Manufacturing Holdings Inc. confirmed Tuesday that it was losing the work. GM in June 2015 announced it would add about 300 new jobs and invest $119 million to produce future vehicle components at its components plant in Wyoming. That investment was part of $5.4 billion GM in April 2015 said it would spend in U.S. plants over three years, creating 650 jobs. One of the sources who asked not to be identified because GM has not announced its plans, said some of the jobs difference at the Grand Rapids plant is the addition of engineering-related salaried positions in Southeast Michigan, including at GM’s Warren Tech Center and its Milford Proving Ground. American Axle announced in July 2015 that it would retain an estimated 75 percent of sales content of the axle and driveshaft work for GM’s next-generation full-size pickup program. The Detroit-based supplier has since updated that figure to retaining 65 percent of that work. It currently builds axles for GM’s full-size pickups at its Three Rivers, Michigan, plant and at its Guanajutato Manufacturing Complex in Mexico. GM’s components plant, operated by its subsidiary GM Components Holdings LLC, has about 530 employees who work on three shifts to produce precision-machined automotive engine components. The automaker on Tuesday said it plans to add 7,000 U.S. jobs in the next few years and invest $1 billion in U.S. plants. The new plant investments will create or retain more than 1,500 jobs, though GM would not say how many would be new. The automaker said it expects more than 5,000 salaried jobs, with a significant portion in southeast Michigan, will come in key growth areas such as with its subsidiary GM Financial and in advanced technology. The announcement comes three days before President-elect Donald Trump’s inauguration. He has pressured automakers to add jobs and work in the U.S. instead of shipping work to Mexico. Hyundai Motor Co. and Kia Motors Corp. said they will spend $3.1 billion in the U.S. in the next five years, joining other vehicle manufacturers in announcing investment plans amid threats from President-elect Donald Trump of higher levies on auto imports from Mexico. The planned U.S. investment by South Korea’s two largest automakers is nearly 50 percent more than the $2.1 billion they spent in the previous five-year period, Hyundai Motor President Chung Jin-haeng told reporters in Seoul on Tuesday. The group is considering building a new factory in the U.S. and may produce Hyundai’s upscale Genesis vehicles and a U.S.-specific SUV in the country, said the executive, who also oversees the strategic planning for Kia. Hyundai and Kia join a growing list of automakers announcing investments in the U.S., even though they have yet to be singled out by Trump. Toyota Motor Corp., Ford Motor Co. and Fiat Chrysler Automobiles said this month they’ll spend on U.S. plants after the president-elect threatened for months to slap Mexico-built vehicles with a 35 percent import tax. Carmakers are eager to cooperate with the incoming administration as they prepare to ask for favors including weaker fuel economy rules and lower corporate taxes. “When automakers such as Toyota announced their new strategies in response to the so-called Trump risk, the industry was nervous and asked, ‘Who’s next?’,” said Kim Jin-woo, an analyst at Korea Investment & Securities Co. in Seoul. “This is positive news that came at the right time as the automakers were facing capacity constraints in the U.S,” he said referring to Hyundai and Kia’s investment plans. Hyundai and Kia will invest about 30 to 40 percent of the $3.1 billion on new technologies such as autonomous driving and green cars. The rest will be spent on facilities and adding new models, according to the company. Hyundai has been considering expanding its plant in Montgomery, Ala., which produces the Sonata, Elantra sedans and Santa Fe crossover. The factory is running at its top capacity of 370,000 cars a year. Kia’s factory in West Point, Ga., is also at full tilt, producing 360,000 units of the Optima sedan and Sorento SUV a year. Kia opened a new $3 billion, 200,000-vehicle-a-year production line in Mexico two months before the U.S. presidential election, with plans to increase capacity there to 300,000 units this year and to 400,000 vehicles by the end of 2018. The automaker may add a new SUV model to the plant in the Mexican state of Nuevo Leon, though the decision isn’t final and the company has “flexibility” on its strategy, Chung said. Kia is targeting to export 80 percent of cars made in Mexico, mainly to the U.S. and Latin American markets. Hyundai and Kia have no additional plans to invest in Mexico and will not transfer production or jobs from the U.S. to Mexico, according to a company spokesman. Forecasting firm LMC Automotive expects automakers will continue to invest in Mexico over the next four years despite tariff threats and social media shaming from President-elect Donald Trump. The study, released Wednesday, said production south of the border for Detroit’s three automakers will increase through 2020, while production in both Canada and the U.S. is expected to fall. The percentage of Mexico-built vehicles sold in the U.S. is predicted to rise, too. And it predicts capacity investment in Mexico will grow at a much faster rate than in the U.S.
“The U.S. currently accounts for two-thirds of North American vehicle production, but significant investment plans and decisions to re-source capacity from Asia and Europe to Mexico are expected to bring Mexican production from 19 percent of NAFTA today to 26 percent in 2020,” the study said. Despite its projections, LMC acknowledged Trump’s policies could impact future decisions. LMC expects overall U.S. vehicle sales to plateau around the 17.5 million mark through the end of the decade, and as a result, it says the number of vehicles sourced within North America will increase. More than 50 percent of that increase is expected to be in Mexico. Among the Detroit 3, Ford’s Mexico production will increase the most (to 757,000 vehicles in 2020 from 387,000 this year) over the next four years, thanks in large part to shifting production of the Focus compact sedan from its Michigan Assembly Plant to Hermosillo, LMC predicted. GM’s Mexico production is expected to grow to 866,000 from 717,000 today, while FCA’s is expected to grow to 460,000, up slightly from 438,000 today. Over that same period, Ford’s U.S. production is expected to fall slightly, to 2,237,000 from 2,395,000. GM’s will dip to 2,301,000 from 2,396,000, while FCA’s will drop to 1,483,000 from 1,538,000. The percent of Mexico-built vehicles for sale in the U.S. will grow for nearly all automakers, LMC says. Ford’s percentage of Mexico-built vehicles for sale in the U.S. will rise to nearly 20 percent from around 10 percent today, while GM will see similar gains. Volkswagen’s percent of Mexico-built vehicles is expected to rise to 40 percent. The lone exception: FCA. The automaker’s Mexico sourcing will decline as it re-sources vehicles both inside and outside the NAFTA zone, LMC says, although Mexico-built vehicles will still account for 10 percent of its U.S. sales mix. The study expects North American production capacity will increase by 3 million units through 2023, and nearly half of that growth will come in Mexico. It says production capacity investment in Mexico will rise 47 percent. Investment in the U.S. will increase 12 percent, while Canada investment will fall 4 percent over that same stretch of time. The findings come despite recent announcements by Ford, GM, FCA, Hyundai and others about investing in the U.S., and in some cases relocating production back to the U.S.
Minutes after his inauguration, President Donald Trump announced his intention to withdraw from the Trans-Pacific Partnership and renegotiate the North American Free Trade Agreement (NAFTA), moves that analysts say could have profound effects on the automotive industry. In confirmation hearings this week, Trump’s choice to head the Commerce Department, former auto supplier executive Wilbur Ross, signaled that renegotiating NAFTA would be an urgent priority. NAFTA, which took effect in 1994, created a free-trade bloc linking the U.S., Canada and Mexico. The White House team said Friday that if the NAFTA partners refuse “a renegotiation that gives American workers a fair deal,” then the president will give notice of the country’s intent to withdraw. If the U.S. makes such a move, a withdrawal from NAFTA would cost at least 31,000 U.S. auto jobs and cause vehicle prices to rise, a recent study by the nonprofit Center for Automotive Research found. Although there was no specific mention of it in Friday’s release, Trump has repeatedly vowed to slap a 35 percent tariff on all Mexico-built vehicles sold in the U.S. The CAR study said that would result in a loss of at least 6,700 North American assembly jobs and 450,000 units of U.S. auto sales. Because Mexican-made vehicles are made of about 40 percent American parts on average, and American-made vehicles are made of about 12 percent Mexican parts, about 20,000 U.S. parts manufacturing jobs and 11,000 U.S. assembly jobs could be lost as a result, CAR said. Mexican President Enrique Pena Nieto, on his official Twitter account, on Friday congratulated President Trump and vowed to strengthen relations between the two governments. But union leaders in both the U.S. and Canada have attacked NAFTA since the beginning. The new administration on Friday also vowed to crack down on nations that violate trade agreements and harm American workers. The scary thing is that Trump has no understanding of how cars and trucks are built, and thus no understanding of how international sourcing can sometimes save jobs both here in the U.S. and in other nations. For example, I've been looking at buying a Ford Transit Connect and wish it was made here, but it doesn't sell in high enough volumes here to make domestic production profitable. If Ford couldn't import the Transit Connect from Spain, we'd lose a lot of the U.S. jobs that produce parts that go into it as well as jobs in the dealer network. Throw up well meaning but thoughtless tariff walls and we'll see U.S. auto plants closing left and right. To the best of my knowledge, I can't think of any US content in the Valencia-built Transit Connect. Low US content is one reason USPS didn't buy it. Originally it was only built at Ford-Otosan, and there certainly was zero U.S. content. With the Mercedes-Benz Sprinter, assembled in South Carolina from German-built SKD kits, the only American sourced part is the battery. Anyway, you'd be happier with a Transit Custom over a Transit Connect. I suspect the Transit Custom would be a better size for me if it were available here, I've got the usual 2 meter tall roll up door clearance on my shop. It's 2.4 meters floor to ceiling so I could get a low roof Transit in their if I converted to a swing door, but that's too much hassle. Going by Ford's recent press release, an electric Transit Custom will be among the products coming to Flat Rock, hopefully they'll build the gas and diesel models there too. As for USPS, they might buy 5000 or so to meet current needs, but they want something with stand up height inside for their LLV replacement order, which means something more the size of a Transit. IIRC Ford has a proposal in on that RFP and may win the contract. Canada Post, without a big van making industry to protect, bought the Transit Connect.